Allow extra travel time today, heavy rain and high winds with gusts up to 50mph possible will impact visibility. Flood Watch in effect until 8pm. 11:42 am – Tree down on power lines in the area of Arnett Holler Road. Foscoe Fire on scene, expect delays in that area. 12:12 pm – Tree down blocking both lanes in the 2500 block of Howard's Creek Road. 12:18 pm – Report of tree trunk blocking lanes in the 2000 block of NC 88 in Zionville Fire district. 12:46 pm – Tree down in the area of 1836 Laurel Fork Road. 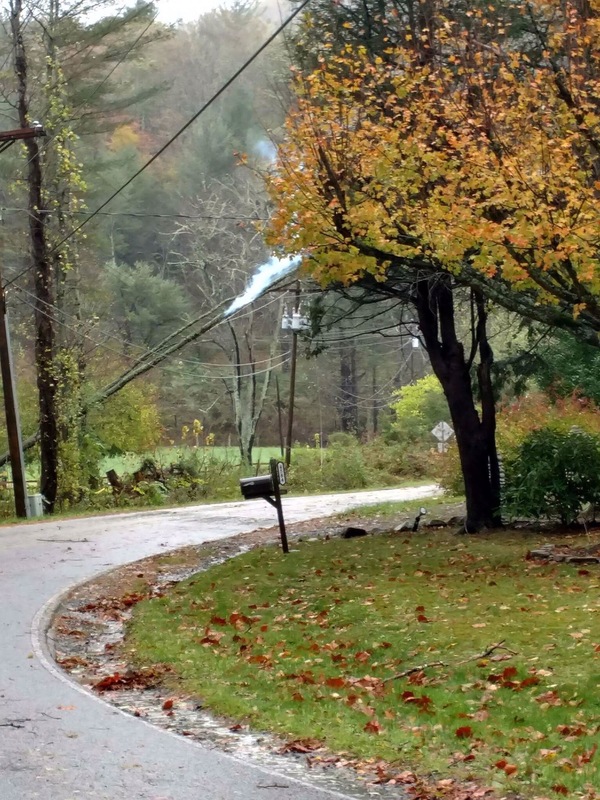 1:56 pm – Tree on power lines and on fire on 194 in Valle Crucis. Photo: Anita Presnell. 4:08pm – West King and Coffey Streets in Boone are flooded per scanner. 4:34pm – Per scanner reports there appear to be a lot of problem areas in Boone, too many to be able to keep up with currently. Use caution across all of Boone, especially near Hardin Park School and the usual flood prone areas. 4:52pm – Getting report of two mudslides, both in the area near Tweetsie and Mystery Hill on 321. 5:14pm – Sunshine in Valle Crucis and on the western and southern ends of the county, Boone trying to clear out as well. 5:39pm – Rescues from apartments on Boone Docks Drive taking place. 5:41pm – Getting report that 321/Rominger Road intersection gravel portion has washed pretty bad. 6:08pm – Rain has stopped across the county. Rescues still taking place in the area of College Place Apartments and Leola Street and Meadowview Drive. STORM ALERT: A shelter will be available for anyone in need tonight (Monday Oct 23, 2017) after 7:30pm at Alliance Bible Fellowship Hall per emergency management. Have not received any reports of flooding this morning but there still could be problems from overnight. 8:28 am – Wreck – 4200 block of 421 on Boone Mountain in Vilas. Expect delays. Payne Branch Road near Flat Top Road cut into by flood waters. Alternate route US321 north to Winklers Creek Road (SR1549) turn left and go to Payne Branch Road. 11:44 am – Accident – Blowing Rock Road in front of Bojangles – Car and bicycle. Expect delays in that area. 3:17pm – Tractor-trailer stuck in the curve on Wilson's Ridge Road from the Bamboo side. Expect delays in that area.